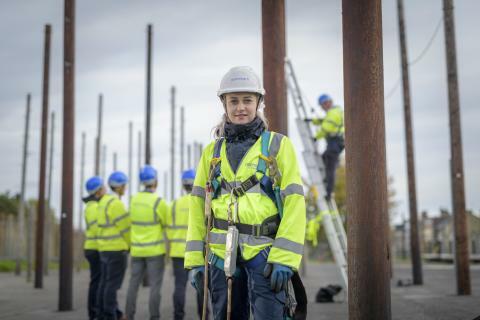 The new roles – in Bristol, Cornwall, Devon, Dorset, Gloucestershire, Somerset and Wiltshire – will see trainees join the country’s largest team of telecoms experts working to expand, upgrade, maintain and install services over Openreach’s national broadband network. Alongside the latest recruitment drive, Openreach is also announcing 11 new locations where it will be building new FTTP networks during 2019ii. This brings the total number of towns, cities and boroughs at the forefront of the FTTP build to 25, with the company on-track to deliver its commitment of reaching three million homes and businesses with ‘full fibre’ broadband by the end of 2020. The locations where Openreach is building FTTP networks during 2019 are Barking & Dagenham, Bexley, Bury, Croydon, Greater Glasgow region, Harrow, Merton, Redbridge, Richmond Upon Thames, Salford, and Sutton Coldfield. Matthew Galley, Openreach’s Partnership Director for the West, said: “We want people from all walks of life to apply for roles at Openreach, to build a diverse workforce that reflects the hugely diverse communities we serve. Last year we successfully recruited more women than ever before – and this year we want to go even further. The new Peterborough training school is one of 12 similar regional centres being built or upgraded across the country and, after Bradford, it's the second facility to become fully operational under Openreach's multi-million pound investment plans - with three more due in the next three months. The site has an interesting engineering and military history which dates back to 1903, when Baker Perkins relocated from London. RAF Peterborough was also established on the site and was used as an RAF Flying Training School between 1936 and 1964. Central to the school is ‘Open Street’, which Openreach has built to mimic a typical residential road. It’s a template for new facilities in our training centres across the UK – giving recruits and engineers a safe, real-life network get to grips with their work.